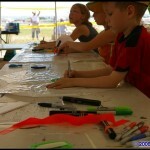 Windscape is an awesome event that is held every year in Swift Current, Saskatchewan! It was truly one of the most fun events I have ever attended in Canada! Traveling by airplane from Toronto to Regina was cool as I got to spend some time with my good friends Gary Mark of Oakville and Lam Hoac of Newmarket. 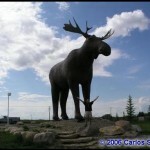 Arriving in Regina we met up with our drivers Ray & Murray Butterfield. Within a few minutes two more kite fliers appeared near us. Normand Girard of Montreal and Stephen Hill from Vancouver had just flown in as well for this event. Faster than you could say “boo” we were all shuttled off to the heart of Regina for an interview with CBC Radio. 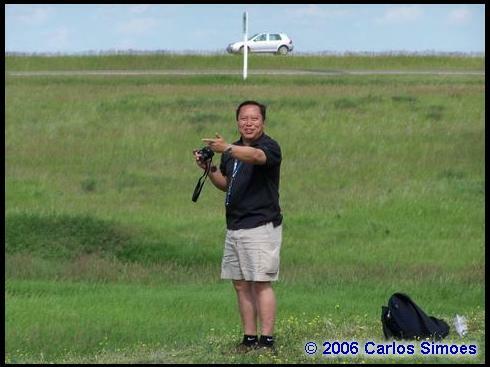 Both Gary and Lam talked up the Windscape event while the rest of us tried to fly kites on front lawn of the CBC building. It was a challenge and great fun at the same time! 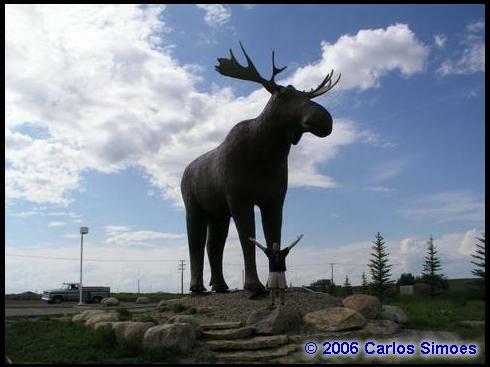 Once the interview was complete we set off on the 2½ hour drive to Swift Current. Once on the highway I could not help the feeling that we were being watched. We were being watched! It seemed like hundreds of gophers were checking us out everywhere we looked. In Saskatchewan it seems that Gophers like to burrow their holes only six inches apart from each other J. The praires are truly flat and the trees are so sparse that it’s miles between the next set of trees. I have been told that every tree you see in this area was planted. 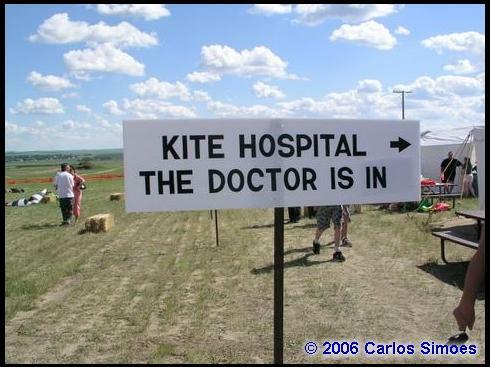 A true kite fliers paradise! We did manage to turn the car radio on in time to catch most of the CBC interview. 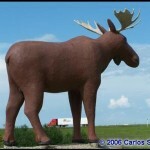 We had our Tim’s coffee fix in Moose Jaw and were r eady for the final leg to Swift Current. Friday night we went up to the flying field to meet the other kitefliers. We also got to check out one of three scheduled bands playing under the big tent. Wow live bands at a kite festival I knew this was a good sign. 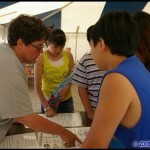 Gary, Lam, Normand and myself entered the tent and quickly found the kite fliers group that had already gathered. They were easy to spot as they were the loudest most boisterous table in there! 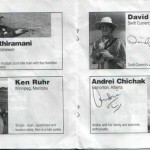 Several of the friendly flyers came right up to us and asked for autographs. Now I really started wondering if I was still really on earth. A kiteflier, being asked for an autograph? This was different! 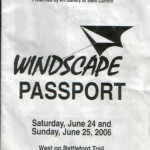 I quickly learned that a Kitefliers Passport is created every year for Windscape. 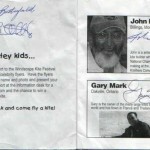 During the two day festival children are given passports filled with photos and descriptions of each flyer. 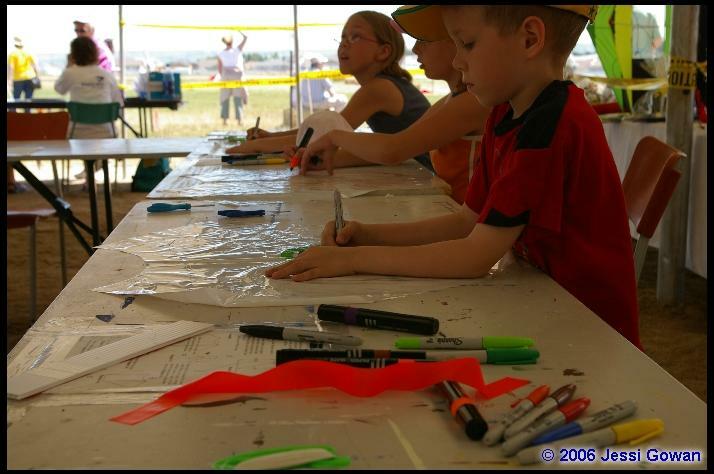 The kids are supposed to walk around the kite field and get as many autographs as they can. When the passport is completed you take it back for popcorn and a chance to win a kite! Now I knew I was in the right place! 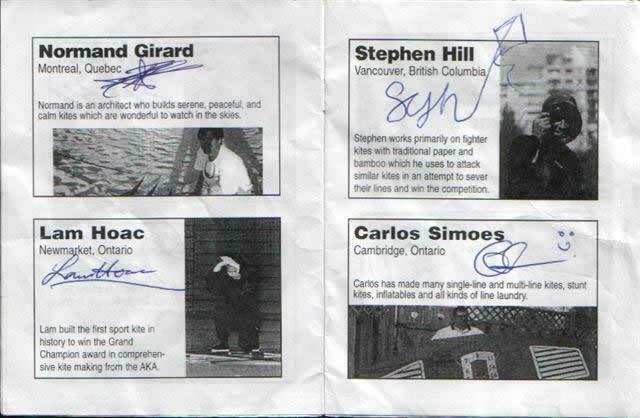 Well it seemed not only the little kids were going to collect autographs but the big ones too. 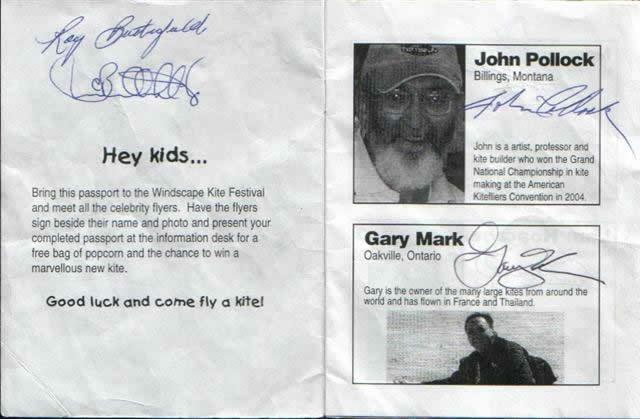 I quickly found a Windscape Passport and got other kite fliers to sign mine too. It was a really nice icebreaker. I got to meet several kitefliers from all over Canada and the US in just a few minutes. This is the most original idea I have seen in quite some time. 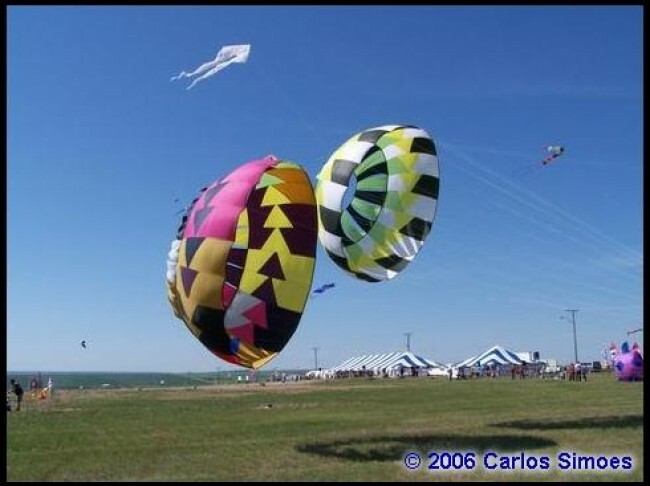 The Blues band was great but soon we all started heading back for some sleep before Saturdays kite festival. In the land of the never ending sun 4am seems like the middle of the afternoon. There would be no sleeping in for me to worry about. 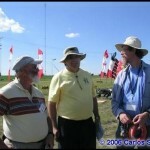 A few of us got together for breakfast and managed to arrive on the flying field before 10am. The flying field was nicely laid out with signs indicating flying areas and demonstration fields. The winds seemed perfect to fly. We had heard that the winds on the plains can really rock your world but they appeared much more tame. More like the lighter winds we experience back in Southern Ontario. 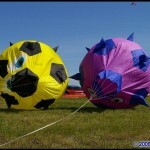 Many of the kite fliers got to put up large foils, windsocks & inflatables in the single line field. Stunt & quad kites were busy buzzing around nearby. In the distance I could see several buggy people scooting around too! 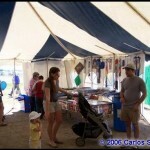 While we were still setting up displays and kites children started to walk over asking for autographs. This was a truly unique experience for me. 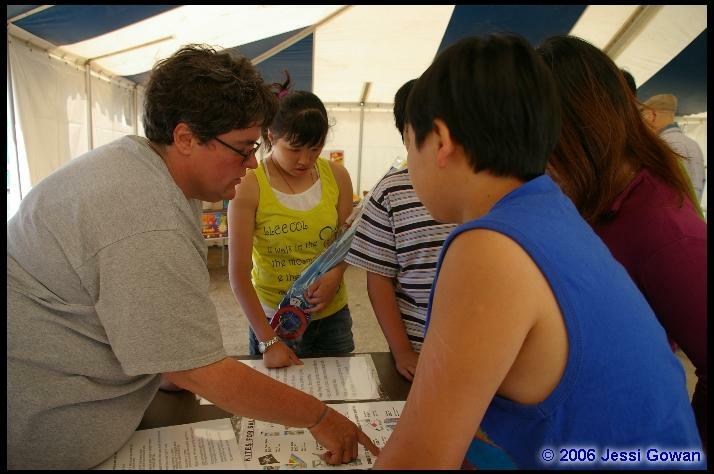 Some of the kids were so shy that parents would come up to get autographs for them. I made a point of having a fun chat with these kids to put them more in the spirit of asking for autographs. 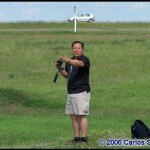 After getting ground displays set up and staking down a couple of kites it was time to mingle. 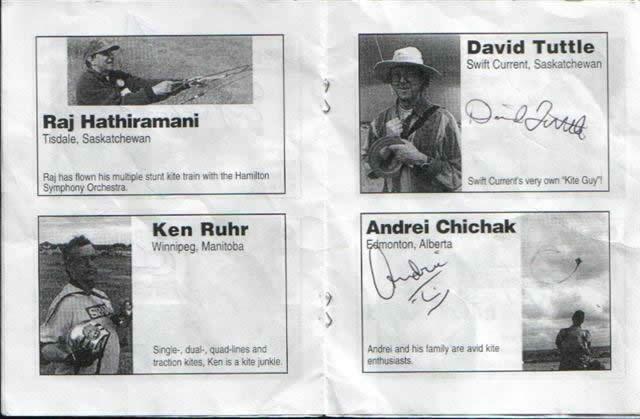 I had studied up on my Windscape Passport the night before and was now ready to venture out onto the field of “kite celebrities”. Of course I had my camera at the ready to get some photos too! Navigating the field means keeping your head down and keeping a keen sense of where the next gopher hole might be. No matter as I finally got my first chance to meet some true kite celebrities and snap some shots of them and their kites. 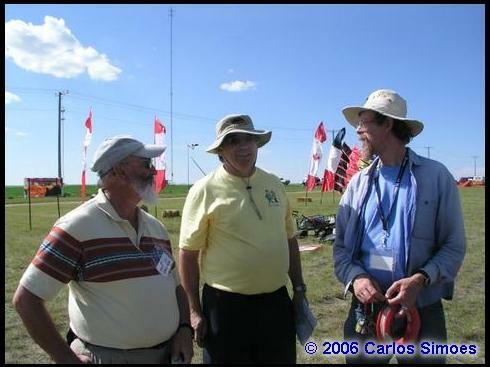 I got a to meet several kite builders like John Pollock, Bev Dockrill, David Tuttle, Don & Alice Guick, Stephen Hill, Normand Girard and several others. 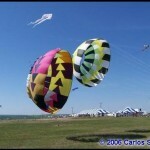 There are photos all over this article covering the flyers and their kites. It was really great just walking around for a bit to see what people were building and flying. Of course in the meantime several children were still walking around asking kitefliers for autographs. 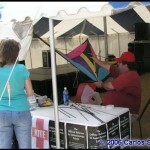 I did note the Stephen Hill truly had a blast sharing his love of kites with the spectators. 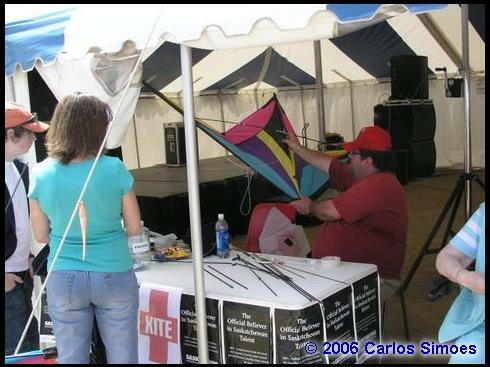 Stephen really loves the more traditional ways of making kites. Then there was Lam hoac who flies from morning till night. 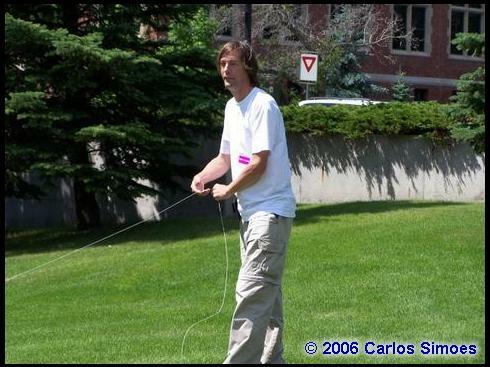 Lam instructed many people on how to fly his stunt kites. Lam just loves to fly! 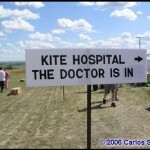 Another fun way to get to meet the public was by working a shift at the “Kite Hospital. 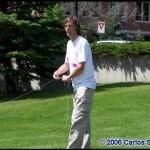 I think it was the first time I was able to repair a spreader on a stunt kite in under two minutes. 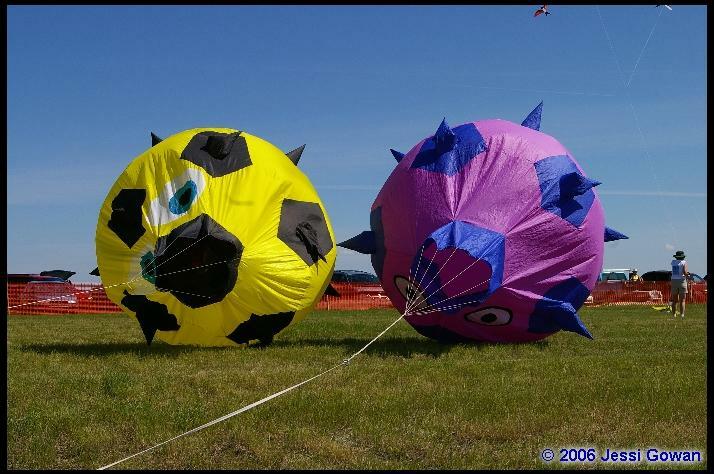 It was funny because it seemed people brought kites that were already broken to the festival. All these little things that get the audience more involved also help spread the infectious joy of flying we al have. 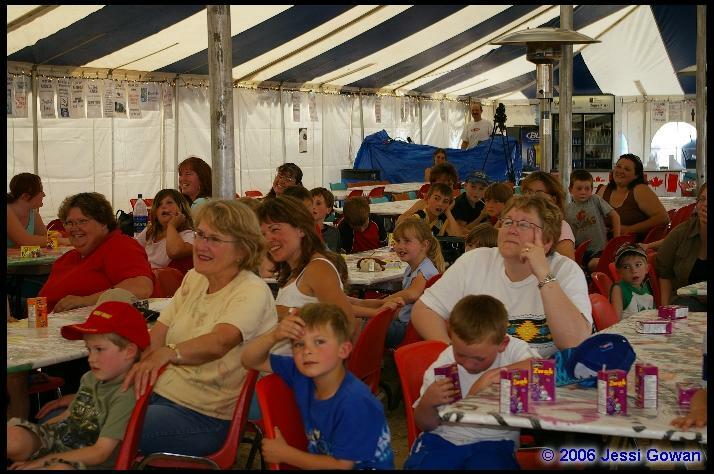 While I was performing more surgery on some kites under the big tent a juggler from Winnepeg was having a great time getting the crowd to participate in his act. Windscape is simply a well run event all the way round and everyone involved should be proud! The evening brought a true classic reggae band to the big tent and several of us flew kites to some great music! Sunday started off with a new wind direction so we all set up new positions for the day. The wind was up and down on Sunday and it changed directions once or twice too! It was fun watching every ones kites slowly turn into a new direction. Fortunately the wind was mostly up so we were able to fly all day. 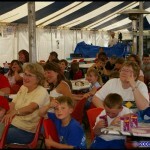 After a great day of flying we all gathered under the tent for pizza and some great kite chatter! 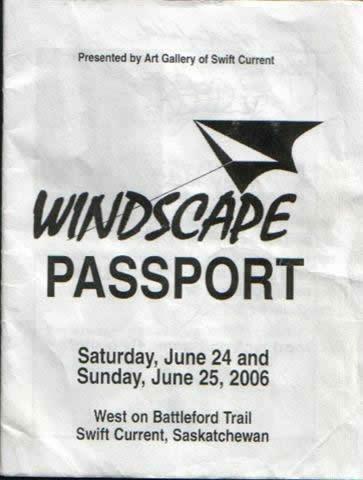 I would like to thank Shann, Ray and Jessi Gowan as well as David Tuttle and the Art Gallery of Swift Current and it’s sponsors for making us all feel so welcome At Windscape 2006. 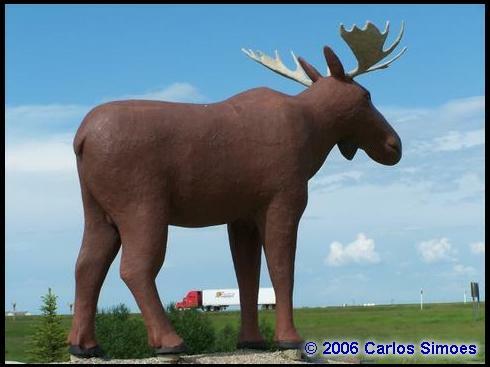 Just like it says on the welcome to Swift Current sign, it’s really a place “where life makes sense”. 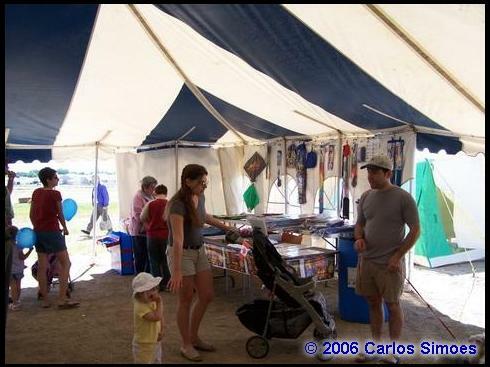 This entry was posted in 2006, Events / Festivals, Issue 49 (Jul/Aug), KL Archive and tagged canada, festival, swift current, windscape.